As a member of the TIEE family of schools, Mt. Helix Academy operates in keeping with the Mission of TIEE, which was adopted by the Board of Directors in 2008 and is presented below. Everyone loves praise for doing the right thing. It tells us that we’ve done the right thing and it feels good. Mt. 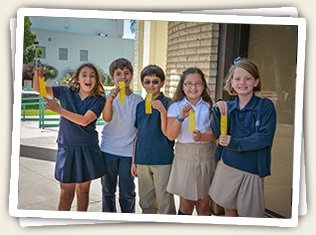 Helix Academy is San Diego’s East County private school that is committed to developing highly ethical, well-rounded students, who love learning. We directly teach our students the skills and knowledge necessary to become high academic achievers, self-managed learners, and confident, charming, creative individuals. We believe that it is our primary responsibility as educators to ensure that every student achieves successfully. Consequently, we consistently implement the following fundamentals of effective education. Mt. Helix Academy teachers’ positive approach makes learning easy and fun, so students love to learn and are a pleasure to teach. Derision, “put downs,” and bullying don’t happen at our school. Mt. Helix Academy uses teaching materials and methods that have been shown by the highest scientific standards to produce measurably superior achievement. Learning is like navigating. Going where you want to go depends on frequent measurement of where you are. Our mastery learning approach demands that our teachers are sure that their students have learned yesterday’s lesson so that they may advance to today’s. We are passionate about the success of our students, so we have set very high standards in all areas. Goals for academic achievement are a must, but we also strive to coach our students to enjoy learning, to make life-long friendships and to be self-managed. Teaching is a principled discipline requiring many sophisticated skills that are rarely taught in depth in teacher training programs. Our staff is comprised of professionals and paraprofessionals who are eager to be the best they can be, and are supervised and coached on a daily basis.